Leading Indicator Facing Important Breakout Test! Homebuilder ETF (XHB) has sent leading signals to the broad market since the highs in 2007 and another very important signal could be sent by what they do at current prices. 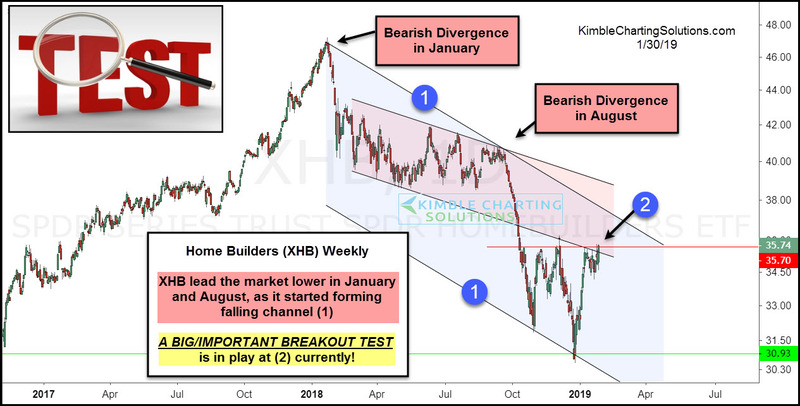 XHB started experiencing a bearish divergence in January and August of 2018, as it reflected much greater weakness than the broad markets. While XHB was falling hard last year, it created falling channel (1). Currently, XHB is testing old highs and new falling channel resistance at (2). Homebuilders are facing a dual breakout test at (2) this week. What they do at (2) should send a very important message to the broad market from this important sector. Keep a close on XHB here friends, as a breakout would send a short-term positive message from them. To become a member of Kimble Charting Solutions, click here. This entry was posted on Wednesday, January 30th, 2019 at 8:46 am and is filed under Chart School, Immediately available to public. You can leave a response, or trackback from your own site.